Our customers in Apple Valley and in the surrounding areas, such as Victorville, California, can ask our mechanics for information about the service life for different auto parts such as for starters or for ignition coils. You can control problems if you replace a part before that part has failed to operate properly. 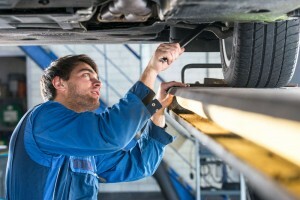 Most parts have a service life, which may be based on the mileage for a vehicle. If you run the engine while a vehicle is parked, then the parts will be affected, but the odometer will not record any additional miles. Some parts may begin to fail such as a starter that does not start the engine with each attempt. A battery will not charge properly if an alternator is defective. When there is a problem, the part should be replaced. You could also simply decide to have a new starter or new alternator installed according to a schedule such as every five years. 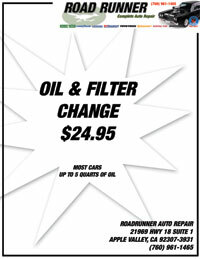 There are schedules for an oil change and for replacing the engine coolant. The fluids are used to prevent the engine from overheating and also to control any damage that could be caused by friction. A schedule can also be used for major repairs such as for a new water pump. If you develop plans, then you will be prepared to cover future costs and can also control serious problems that could force you to be stranded on a deserted road in Victorville, California. Some customers cannot afford repairs and will incur additional costs for a rental car while a vehicle is disabled. You can use schedules to plan for major repair services such as for a new starter, ignition coil or timing chain. A household budget should include a monthly amount for auto repairs because those parts will eventually break. Our customers in Victorville, California, can conveniently make an appointment to speak with our mechanics about any concerns. If you plan to replace auto parts, then you can control future problems. There would be a lower risk factor for the possibility of being stranded on a busy highway with a disabled vehicle. You can reduce the number of emergency situations that could force you to be late for work. Our customers in Victorville, California, and in the surrounding areas can rely upon the professional services from the Road Runner Auto Care Center in Apple Valley.